Lean Construction is a philosophy and a practice that informs every project we take on at BMWC. It’s a holistic approach to construction that doesn’t follow a traditional top-down workflow. Instead, it’s a bottom-up process that encourages useful contributions from everyone involved with the project. It also means never starting work that we aren’t fully prepared to complete. 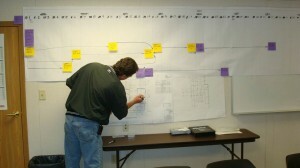 We use Lean Construction techniques to eliminate bottlenecks and allow efficient and timely project execution. Collaboratively planning meetings with owner representatives, construction managers, foremen and skilled craftsmen enable all parties to share specialized knowledge on an equal platform. These individuals have the experience to know what works and what doesn’t, so a Lean Construction approach often leads to innovative solutions that can make a project more cost-effective. We want every project we work on to be the best it can be. To be the best, you can’t stick with a rigid set of rules. Since Lean Construction is an elastic process, we’re always adapting to become even better. We listen to the men and women on the ground — the men and women with decades of real-world jobsite experience — because we want to make sure a great idea never gets overlooked. Want to see our Lean Construction approach in action? Check out this video of one of our lean planning sessions.